A doctoral student rallies for NTE faculty unionization in 2017. The bid to form a union eventually failed Tuesday when formerly contested ballots were counted, and only two of the 25 voted in favor. 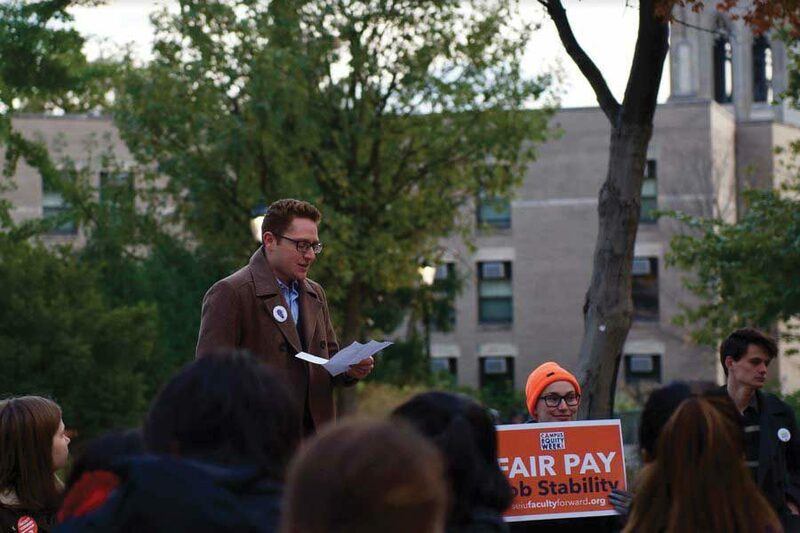 A two-year long struggle to form a non-tenure eligible faculty union failed Tuesday after a final tally was completed by the National Labor Relations Board. Since NTE faculty first filed for the unionization election in June 2016, the process was repeatedly delayed by ballot challenges, most of which were later resolved. Students and faculty had grown increasingly impatient over the lack of progress until the recent verdict. The union was intended to represent full-time faculty and contingent faculty who were not eligible for tenure, which includes professors who teach one course a year and post-doctoral researchers. Here’s a recap of events since faculty members filed for union election in 2016. The call for a union came after the University began to employ non-tenure line and part-time faculty members. Those employed part-time have little job security or benefits, putting them in an “unstable situation,” psychology Prof. Marcia Grabowecky told The Daily in June 2016. Of the of 490 ballots cast in the initial vote in July, 134 were challenged when voter eligibility was called into question. The University and Service Employees International Union resolved 63 of the challenged ballots and redistributed them accordingly, said Daniel Nelson, who at the time was assistant regional director of the NLRB’s Chicago office, but had yet to resolve the remaining 71. Of the valid ballots, 223 were in support of forming the union and 191 were against. The final valid ballots were not counted until May 2017, and the Chicago office of the National Labor Relations Board issued a certification of the election on May 26, confirming membership to the SEIU for non-tenure eligible faculty. “Since our union election, we’ve continued to support and feel the excitement of the growing union movement in higher education,” Italian lecturer Alessandra Visconti said in a news release from SEIU that May. However, 25 contested ballots still remained unresolved and the University refused to begin bargaining until they were counted. In September 2017, NTE faculty filed unfair labor practice charges against the University, because the administration had still not begun to negotiate collective bargaining with the union. Associated Student Government passed legislation to support the NTE faculty in October 2017, but the University was unmoved by ASG’s decision and continued to refuse to negotiate. Students also rallied at the Rock that November in support of the union. In April 2018, Faculty Senate voted to support NTE faculty without getting involved in unionization efforts. Elsa Alvaro, who was head of the Non-Tenure Eligible Committees, recommended the Senate leave the unionization process to the NLRB. The bid to form an NTE faculty union eventually failed Tuesday after federal officials granted the University’s request to include 25 contested ballots in the final count. Just two voted in favor of joining the SEIU, while 23 faculty members voted against. The final vote tally was 242 against joining the union, 231 in favor.